Select an artist whose work has not been studied in class. In point form present a brief biography of the artist’s life. Salvador Domingo Felipe Jacinto Dalí i Domènech was born on May 11, 1904 in the town of Figueras, Catalonia, Spain, and was the son of a prestigious notary public. Dali devoted much time to drawing and painting, and showed substantial talent for artistry when he was young. Dali was spoilt as a child and began acting aggressively towards others when he was ten. Dali loved to throw himself down stairs when he was young. This was to attract other people’s attention. In another incident, Dali was given a wounded bat, which he placed in a washhouse. The next morning, he found it decomposing and covered in ants. Out of pure passion, he bit the bat, and the image of frenzied ants can be seen in some of his works such as the Persistence of Memory, 1931. Dali was a poor student at the Academy of the Brothers of the Marist Order, although he showed great talent in art. Dali became obsessed with a room full of Pitchot's Impressionist paintings in the tower, and spent hours there admiring them, eating, and painting. In 1920-1921 Dali was exposed to, and influenced by, the Italian Futurists, Bonnard, and Eugene Carriere. 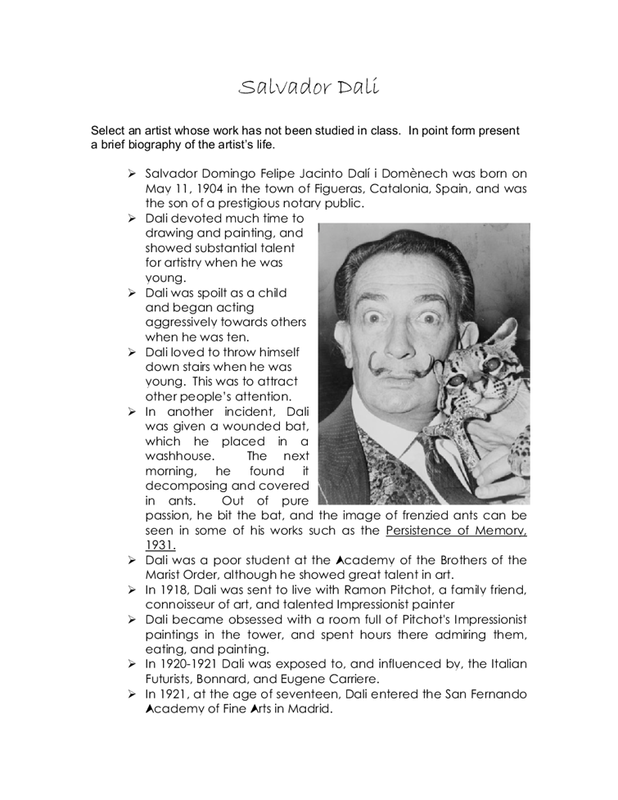 In 1921, at the age of seventeen, Dali entered the San Fernando Academy of Fine Arts in Madrid. Dali was suspended for one year at the Academy in 1923 because of indiscipline. Dali’s antisocial behaviour continued after he returned to the Academy, and he was subsequently expelled in 1926. In 1928, Dali moved to Paris, and was exposed to the Paris Surrealists. He joined the movement in 1929 and produced his first surrealist paintings, including Illumined Pleasures, 1929. In that year, Dali also met his future wife and lifelong partner, Gala. She would feature in most of Dali’s works. In the late 1930's, Dali's painting style moved to a more academic style. Between 1937 and 1939, Dali made three trips to Italy, where he studied Palladio, the Renaissance, and the Baroque. It was these influences that had him expelled from the Surrealists. Before Hitler’s invasion of France, Dali and Gala fled to America, where he wrote his autobiography The Secret Life of Salvador Dali. Dali and Gala returned to Spain in 1948, where they lived for the rest of their lives. Dali’s style then returned to classicism, and this is seen in such works as The Madonna of Fort Lligat, 1950, and The Last Supper, 1955. In 1960, Dali started work on the Teatre Museu Gala Salvador Dalí in Figueras, which opened its doors in 1974. He put much of his effort and energy into the museum, which he continued to expand into the mid 1980's. Dali’s muse, Gala, died in 1982, and he lost much of his will to live. He became a recluse at his home in Pubol, where he finished his last painting The Swallow's Tail, 1983. In 1984, a mysterious fire broke out in his bedroom, which some suspect as a suicide attempt, and he was severely burned. 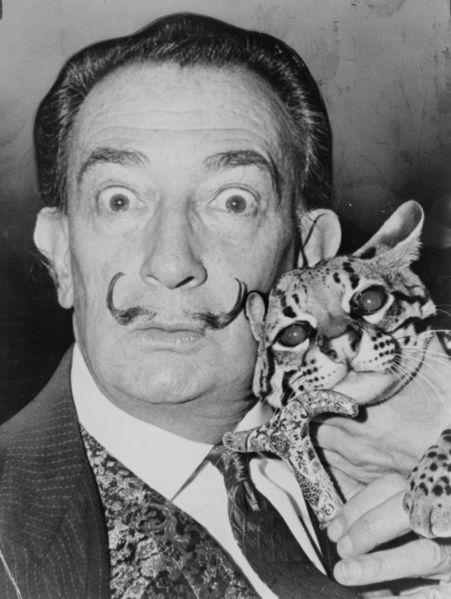 Salvador Dali died on January 23, 1989 from heart failure. identify the style that the artist works in. explain the characteristics of this style. 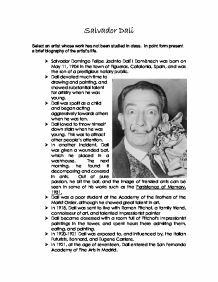 Salvador Dali's life and art were very closely related. Everything in his life was reflected in his art. All the major changes in his works and styles represented important turning points for him. When Dali was younger, he experimented with different styles. The first style he used was soft, blurry and seemed a little bit out of focus, although his use shadowing was well from the beginning. Dali's early works were not very impressive, but he was very talented and dedicated to his art work. Surrealism is a form of painting that Dali started using next. The purpose of this kind of art was to mirror society and show it what was wrong with it. For example, Dali was not friendly with the aristocrats of his time, in fact he hated them. So one of his surrealist paintings showed an aristocrat with no face. This was supposed to symbolize that aristocrats did not listen to anyone. It was also during Dali's surrealist period when he expressed many of his sexual ideas in his works. Some examples of these types of works would be The Apparatus and The Great Masturbater, and many other of Dali's paintings possessed sexual meaning. This was also a period in his life when he was very interested in psychology, especially Freudian psychoanalysis. Dali even showed Freud in some of his works. Surrealism was a important tool for Dali, using it he could express his feelings, dreams and political standings. His art sometimes seemed as if it was a way for him to put all the delirium in his head down on canvas, and that was what makes it so interesting. Surreal painting was where Dali first started using a extraordinary, fascinating style of art, that style is called double imagery. This was when he showed two different images in the same painting. This time in his life was also emphasized because it was when he first met his wife Gala. Gala was thirteen years older than Dali, and many people especially his father thought they were crazy for being lovers because of this age difference. It did not effect them though and they got married and stayed life long companions to each other. For this reason Gala was a very important part of his life and therefore appeared in many of Dali's works. Gala was responsible for bring Salvador back to the Christian faith which completely changed his style of painting, from surrealism to classical. These classical works were Dali's most moving works. This was the time Dali was influenced by new beliefs and new discoveries. He was now more interested in science than ever before, and the recent discovery of the atom and the double-helix structure of DNA. He continued to use double imagery, and it was at this time when he created his majestic masterworks. As a masterwork was over five feet in any direction and took over a year of Dali's year to produce. These were sixteen larger than life works that were very inspiring. These masterworks were good examples of showing Dali's understanding between science and religion. describe the way the artist uses materials and techniques. "... A spontaneous method of irrational knowledge based on the systematic objectification of associations and delirious interpretations..."
He states that it is just an impulsive technique, which involves breaking down the barrier of the mind’s way of thinking, so we can create our own perception of objects. While Dali painted an active process of the mind would allow him to visualize images, which he would include in his painting and help him achieve his final product. Photocopy three examples of the artist’s work. Identify the title, date, size and materials of each example. Underneath each photocopy, write a brief description of the artwork. Daddy Longlegs of the Evening - Hope! When first seeing this painting, one may think that it is filled with death, decay and destruction. The drooping corpse and the melting shapes reveal the feeling of melting away and dying. This painting is filled with so much more than pain. 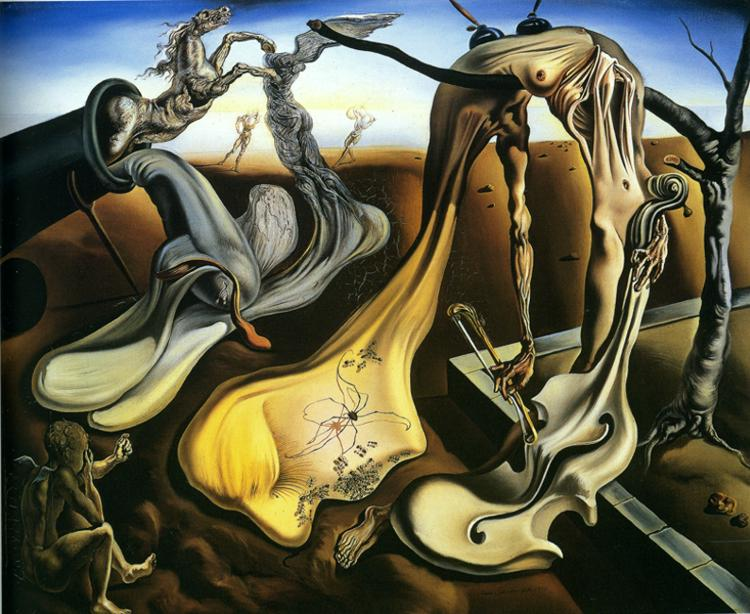 No matter how ugly the situation is, there is still hope and this is what Dali wants to prove to us with this surreal painting. Painted in 1940 in the beginning of the Second World War, Dali wanted to examine dismay of the war and enlighten the viewer with hope. To the left of the canvas we see a giant canon held up by a crutch. Crutches are a metaphor that Salvador uses in many of his art works as a symbol for existence and fatality. The canon simply represents the destruction of the war. Firing from the canon into the lonely blue sky is a single white horse. The horse, full of dominating speed, could resemble one of The Four Horsemen from the Apocalypse, as the events occurring in Europe at that time could bear a resemblance to the legendary Apocalypse. The corpse strung over the tree is really a self-portrait of Salvador Dali, as he often includes self-portraits in his paintings. Resting on the top of the figure are two inkwells, which generally represent the signing of the treaties but Dali often uses them as a sign of sexuality. Devouring the soft melted face are tiny black ants. The ants emphasize they decay and decomposing of the painting. Ants are another common element in his paintings. In the bottom left corner, a cupid figure sits alone. The symbol of purity and innocence is thrown into this painting, horrified of the monstrosity of the destruction. The cupid resembles a little light but also brings pain into the picture, as it appears like a young child crying in fear. Lastly, in plain view we see a spider, which is a Daddy Longlegs. The black spider is placed in the center on a very light background making it the center of focus. Daddy Longlegs, when seen in the evening, are French symbols for hope. Dali wants to express that amongst all the tragedy; there will always be hope and that is the one thing that can never be stolen from you. The setting for this image is an expansive, smooth gray plane. It is elevated on the right and steps down to a lower level at the left. Clustered in the middle of this space is a variety of strange and colorful surrealist images. In the distance is the small shadowy figures of a man holding the hand of a small boy. Toward the left is a figure seated in a chair with his back turned to the entire scene. This work was created during a time of extreme personal stress for Dali. His father was becoming increasingly disappointed with his son’s choice of profession and unorthodox behavior. 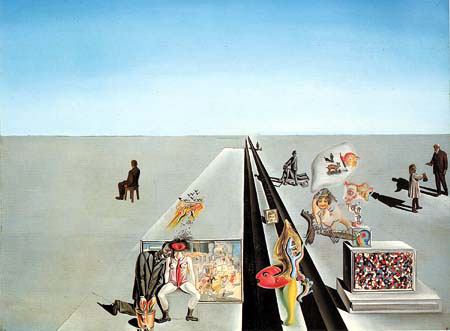 The figures of the man and boy appear several times in Dali’s future works. They represent Dali’s wish to heal his relationship with his father. The seated figure on the left has also been speculated to represent the artist’s father. no relevance in an effort to reshape public mindset. 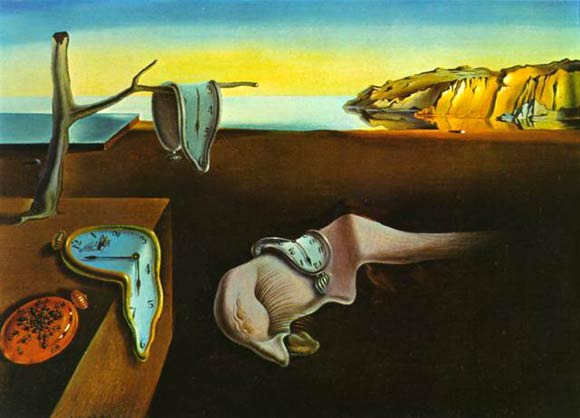 his paintings, thus creating the famous melting watches. In tribute to the place that birthed such an idea, he used Cape Creus as his backdrop because it was a definitive symbol of his personal peacefulness. The monstrous creature draped across the painting's center resembles the artist's own face in profile; its long eyelashes seem insectlike or even sexual, as does what may or may not be a tongue oozing from its nose like a fat snail. This student written piece of work is one of many that can be found in our GCSE Art section. Provide a brief description of the stylistic attributes and conceptual principles of surrealism. The Development of Landscape Painting in the Italian Renaissance. The drawing, however, is not a painting, and Leonardo's landscapes on canvas still remain in the background. Yet, they are informed by his drawn studies, sparked by an interest in the process of erosion relating to water and rock.10 Leonardo stands as a transitional painter between the symbolic and naturalistic depiction of landscape. One of my uncles is an artist, and he has taught me about art and drawing since I was a child. He has also taught me dance alittle bit as well! In a way, I have also been influenced by Bruce Lee, by his life. Her face is composed of similar tones that are all based off the same yellowish-reddish-light brown color. that he is a highly respected person in society and by changing into Hyde, he feels like a burden has been lifted off his shoulder and he has nothing to feel cause for concern for so thats what makes him feel "lighter". working class and all armed attacks on it cannot fail to be considered by us as attacks on thought likewise." 2 Sigmund Freud's recognition and exploration of the unconscious mind had led the poets to delve deep into their psyches, through dreams for example, and to make literary use of the images found there. Most of the canvas of the painting has been painted in darker tons. Where there are darker tons of colors, there are also ruminants of how Corday killed Marat. The knife Corday used to stab Marat is placed on the dark floor. However he emerged as one of the greatest artists of his time. Through contact with the Impressionists, Cezanne began to paint nature and gradually developed a completely new style, which established him as the 'father of modern art'. From about 1870 Cezanne started painting directly from nature. His work was always different even then as in the 1960?s schools were usually segregated, with the boys learning woodwork and the girls cooking, so Michael brought something new and different skills into his work. His approach was the key though, Michael was thoughtful and profound about why, which and what he was doing with his artwork.